↑ "Los Angeles Times Hollywood Star Walk – Spencer Tracy". latimes.com. Los Angeles Times. Archived from the original on May 7, 2016. Retrieved April 20, 2017. ↑ "AFI's 100 Years ... 100 Stars". American Film Institute. June 16, 1999. Archived from the original on January 13, 2013. Retrieved February 20, 2012. 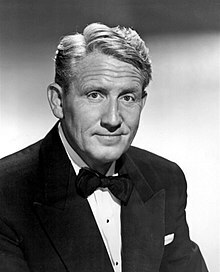 ↑ "Spencer Tracy". Ripon College. Archived from the original on September 27, 2011. Retrieved November 30, 2011.